It was another crazy day at the HSBN March Madness tournament on Monday for Miami teams, and at the end of play, there were still five that are alive to reach the championship game. Mater Lakes, Coral Park, Ferguson, Braddock, and Brito all head to the final day of bracket play with a chance to reach the title game. Miami teams turned out big on day two. Ferguson defeated Champagnat 10-1, while Brito handled Miami Beach 4-1. Mater Lakes also took care of business, downing Dr. Krop 6-1. While all of those teams were impressive, it was Braddock’s Anthony Navarro that delivered perhaps the outing of the tournament so far. Navarro went the distance in the shutout, giving up only four hits, while striking out six and walking none against the #6 team in the county, Westland Hialeah. The win was the second in a row for the Bulldogs, who seem to have found their groove in the March Madness tournament. 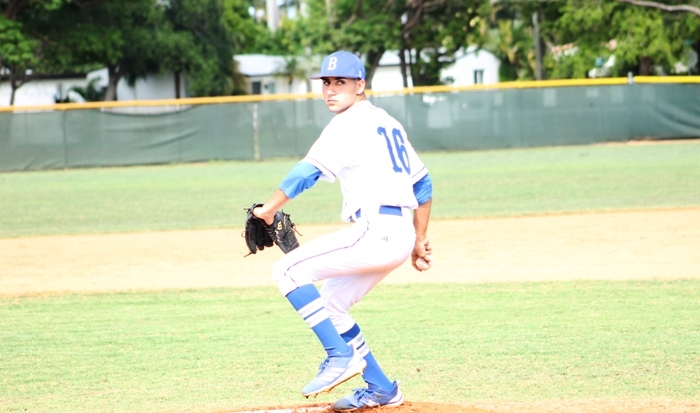 Braddock now has thrown back to back 3-0 shutouts, and is in position to reach the championship if they can beat Brito Tuesday afternoon and keep their runs against low. The Panthers are having a stellar tournament of their own. There have been several years where Brito has come into the March Madness tournament on a roll, and left struggling. This, however, does not appear to be one of those years. Brito opened the tourney with a win over Westland, and took care of Miami Beach, setting up a possible winner in the title game matchup with Braddock. Mater Lakes Academy started their tournament by upsetting Miami’s #4 team Southwest 4-1. After defeating Dr. Krop, the Breas can keep their title hopes alive with a win over Sunset Tuesday. Coral Park is the last Miami team with a shot to reach the title game. The Rams will have to keep their runs against total low, while also beating Mater Academy in their final bracket game.